International Alhijamah Therapist Association - www.i-ata. org - Blood is a tissue found in the blood vessels that warnannya red. The red color of the situation did not remain dependent on the amount of oxygen and carbon dioxide levels in it. Blood that contains carbon diogsida crimson color. The presence of oxygen in the blood is taken by way of breathing, and the substance is very useful in the event the combustion / metabolism in the body. Vikositas / viscosity of blood is thicker than water that has a BJ from 1.041 to 1.065, temperature 380C, and pH from 7.37 to 7.45. Blood circulating in the body forever because of the work or the heart pumping. During the blood circulating in vessels so the blood will remain liquid, but when he came out of the veins and then he will be frozen. These clots can be prevented by mixing into the blood is a little anti-freeze / citrus natrikus. And this situation will be very useful if blood is needed for blood transfusion. In a healthy body or adult blood contained as much as about 1/13 of body weight or approximately 4-5 liters. Circumstances that amount to each person are not the same, depending on age, occupation, state of the heart, or blood vessels. Taking in oxygen / combustion of substances from the lungs to tissues throughout the body's circulation. Transporting carbon dioxide from the tissues to be removed through the lungs. Take nutrients from the intestine to be circulated and distributed to all tissues / organs. Lift / remove substances that are not useful for the body to the kidneys and excreted through the skin. b. As the body's defense against disease and toxins in the body through the medium of leukocyte and antibody / anti-toxic substances. c. Spread the heat throughout the body. Minerals: 0.9% (natrium klorida, natrium bikarbonat, moves fosfat, magnesium, kalsium, I truly besi). Organic matter: 0.1% (glucose, lipids, uric acid, creatinine, cholesterol, and amino acids). of red blood cells (erythrocytes) is shaped like a disc / bikonkaf and has no core. Diameter size of approximately 7.7 units (0.007 mm), can not move. Number of approximately 5 million in 1 mm 3 (41/2 million). The color is reddish yellow, because it contains a substance called hemoglobin, the red color will grow if it contains a lot of oxygen. function of red blood cells are the oxygen from the lungs to be circulated to all the tissues of the body and bind carbon dioxide from body tissues to excreted through the lungs. Binding of oxygen and carbon dioxide is carried by hemoglobin that has been compounding the oxygen called oxyhemoglobin (Hb + Hb oxygen-oxygen 4) to be transported from the whole body oxygen as oxyhemoglobin which later after arriving in the network will be released: Hb + Hb oxygen-oxygen, and so on. Hb was going to compounding with carbon dioxide and carbon dioxide is called hemoglobin (Hb + Hb carbon dioxide, carbon dioxide) in which carbon dioxide will be released in the lungs. red blood cells (erythrocytes) are produced in red bone marrow, spleen and liver . The process of formation in the bone marrow through several stages. Initially large and contains a nucleus and do not contain hemoglobin and hemoglobin loaded and ready to finally lose the nucleus and circulated in the blood circulation, which then circulate in the body during kebih approximately 114-115 days, after which it will die. Erythrocyte hemoglobin out of the dead will break down into two substances, namely Fe-containing hematin which is useful for making new red blood cells and hemoglobin is a substance contained in eritrisit useful to bind oxygen and carbon dioxide. 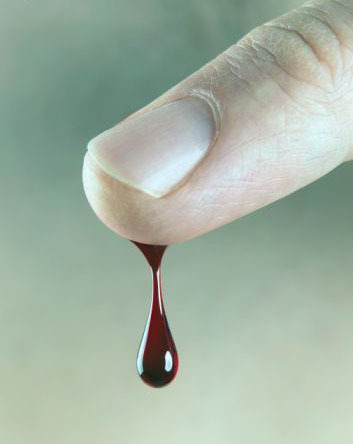 Number of normal in adults is approximately 11 , 5-15 grams in 100 cc of blood. Normal Hb 11.5 mg% of women and men 13.0 mg%. Red blood cells need protein because its structure is composed of amino acids and also require iron, so iron is needed diit balanced. In the body the number of red blood cells can be reduced, so does the amount of hemoglobin in red blood cells. If both are reduced, the condition is called anemia, which is usually caused by a great perdarahaan, disease melisis erythrocytes, and the making of disrupted erythrocytes. The form and nature of different leukocytes with erythrocytes nature when we look under a microscope you can see the shape that can be volatile and can move by means of false legs (pseudopodia), has a variety of cell nucleus so that it can be distinguished according to the cell nucleus, the color is clear (colorless), the amount in 1 mm3 of blood is approximately 6000-9000.
function as a defense of the body that is killing and eating germs / bacteria that enter the network RES (retikuloendotel system), place in pembiakannya spleen and lymph nodes; as a carrier that is transporting / carrying of fatty substances from the intestinal wall through the spleen continues into a vein. Tues besides leukocytes are also present in blood vessels throughout the body tissue. In most diseases are caused by the entry of germs / infection, the number of leukocytes in the blood will be more than usual. This is due to leukocyte cells that normally live in the lymph nodes, is now circulating in the blood to defend the body against disease. If the number of leukocytes in the blood exceeds 10000/mm3 called leukocytosis and less than 6000 is called leukopenia. Lymphocytes, leukocytes kind resulting from RES tissue and lymph nodes, in form of large and small, in the cytoplasm and there is no essence of the gland, the amount of approximately 20% -15% and its function to kill and eat the bacteria that enter the jarigan body. Monocytes. Most are made in the red marrow, larger than lymphocytes, their function as phagocytes and the number of 34%. Under the microscope shows that protoplasmanya wide, gray-blue color has a slightly reddish spots. Cell nuclei are round and long, the color mauve. or polymorphonuclear leucocytes also called, has a nucleus which is sometimes as separate, protoplasmanya many fine spots / gland, the number of 60% -50%. size and shape nearly with neutrophil granules and cytoplasm but larger, the number is approximately 24%. These cells are smaller than eusinofil but have irregular-shaped nucleus, in the protoplasmanya contained large granules. Half the number of red marrow, its function is unknown. Platelets are small objects off the shape and size vary, some round and oval, white color, normal in adults 200.000-300.000/mm3. function plays an important role in blood clotting. If the number is less than normal, so if there is no quick cuts blood clot causing persistent bleeding. More than 300,000 platelets is called thrombocytosis. Less than 200,000 platelets called thrombocytopenia. (Cupping Therapists Association of Indonesia) in the blood plasma contained a substance that also helps the blood clotting events, namely Ca2 + and fibrinogen. Fibrinogen start working when the body gets injured. when we wound the blood will come out, platelet rupture and release substances called trombokinase. Trombokinasi will meet with the help of Ca2 + prothrombin to thrombin would be. Will meet with fibrin thrombin which is a fine threads, form an irregular network of its location, which will hold blood cells, thus there was freezing. Prothrombin made ​​in the liver and to make necessary vitamin K, vitamin K is thus essential for blood clotting. The fluid portion of blood that forms about 5% of body weight, the media circulation of blood elements that form red blood cells, cells white blood cells and blood clotting as well as the transport medium of organic and inorganic material from a tissue or organ.